I’m on to the 9th Brigade this week to try and finish up the 3rd Canadian Division. I finished up the 7th Brigade last week, and finished the 8th Brigade two years ago. 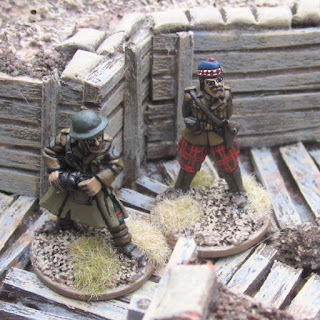 After the 43rd Battalion (pictured below) I only have two more battalions (58th and 116th) to finish up the 9th Brigade – as I had painted up the 52nd (Northern Ontario) Battalion last year. The initial members of the 43rd Battalion were recruited by the militia 79th Regiment (Cameron Highlanders of Canada) in Winnipeg, Manitoba. All the figures from this brigade are from Brigade Games. I don’t’ love these Brigade Games highlanders. I’m not saying I hate them, or “they’re awful” or anything – they have a lot going for them; I like the chunky rifles that might survive a fall from the tabletop… They are very simple and easy to paint… I like the kilt arpron… But there are a few things that drive me just crazy. Their jacket looks more like a WW2 battledress jacket (which highlanders, at that time, wore with their kilts…) than the cutaway jacket the highlanders of the Great War were issued. I suppose I could have corrected this with a LOT f green stuff… but I was just too lazy (or, actually, didn’t think of it unitl now… but then also realized I would have been too lazy had I thought of it before…) they have no respirator, but I can live with that. Also the Lewis gunners… first of all, Brigade games doesn’t even MAKE a highlander with a Lewis gun, so I had to convert this team. Second, I am, in general, no fan of prone figures for wargaming – as they take up more space than other figures (and messes up the nice, neat, even lines of figures in my storage drawers), they can’t be stood up in trenches, or be seen when next to hedges or walls, etc. 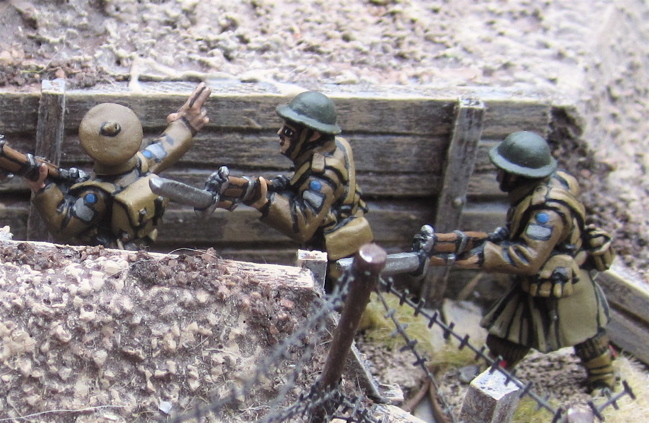 But what drives me REALLY CrAzY is when a light machine-gun team are the ONLY prone figures in the entire line!? if there were a few crounching and kneeling figures I could live with a prone figure or two – but when EVERYONE ELSE is standing and advancing and the only prone figures are two odd machine gunners… ugh.. so annoying. Because the figures come in packs with two teams one is advancing and one is prone, I briefly considered buying TWO MORE PACKS just to have all four teams advancing like the rest of their units… but as the packs are $16USD that would have meant spending anther $32USD – just to have two more advancing teams… which would be ridiculous. Detail of the formation patch. Grey rectangle of the Third Canadian Division, surmounted by a blue circle – blue for the 3rd brigade in the division, circle for the senior battalion in the brigade. One of these things is not like the other (I mean, other than the prone Lewis gun team…). More of the 9th Brigade… or possibly some guns…? Once I finish off the 3rd Division, I’ll probably get to work on the 1st Division – as I have some of those miniatures – the 1st Brigade, at least, and part of the 2nd. 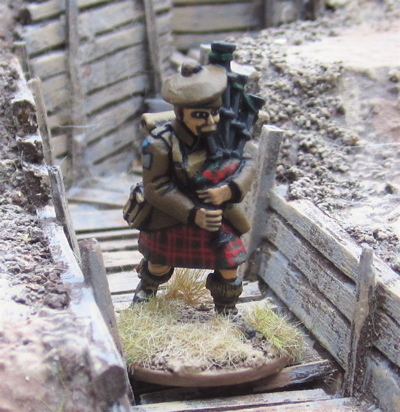 Well, you might have had issues but I think they are great looking highlanders a nice piper and command too. seriously, how can that not bother anyone else...!? The Guns of … April?